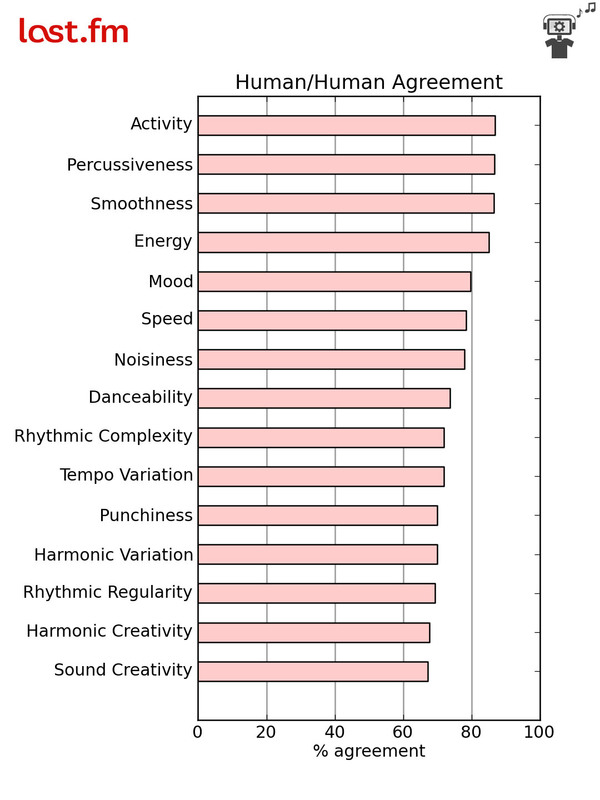 I’m very happy to see that my old colleagues at Last.fm are pushing ahead with their research on audio descriptors â€” and indeed the psychology of human music labelling. Under the tongue-in-cheek title ‘Advanced Robotics’, a new blog post describes their advances in finding out whether people agree on ‘smoothness’, ‘speed’, ‘harmonic creativity’ and many other (sort of) intuitive ways of describing music, and also whether they have computer algorithms (‘robots’) that can mimic that behaviour. Why I’m so excited about this? Because it’s great stuff, but also because I was involved in designing some of the robot ears â€” the algorithms that have now tested on how well they imitate what people perceive. Check it out!